I’ve had this book for so long I can’t even remember how I came across it. I’ve shuttled it around from apartment to apartment and finally to this house, where I finally read it. 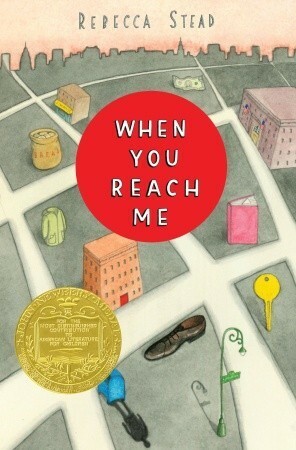 When You Reach Me won the Newberry Medal in 2009. I think I held off on reading it for so long because it’s labeled Middle-Grade and whenever I had a free moment, I would choose something else. But as I’m trying to catch up on my reading goals, I selected it since it was so thin and looked to be a quick read. I liked the story that Stead wove. And can I say this is the first time I’ve been utterly taken by surprise by a middle-grade novel? Or perhaps even a YA novel? I had no inkling of where the plot was going until it got there. And yet, the groundwork was laid. I just didn’t recognize it as important. Reading this novel also makes me want to get down to reading A Wrinkle in Time by Madeline L’Engle. Sadly, I have never read this novel. I know. Everyone and their brother has read it. But not me. Heard of it plenty, sure. But never read it. I think I will need to take a trip to the library soon and read it. This is a sweet story that is not to be missed. A powerful and curious tale of childhood and the paths our lives take when we don’t notice.